Public speaking can earn you millions of dollars over time. Here’s how to get started, even if you have zero experience giving talks. This article is written by Jason Capital, best-selling author of “Higher Status,” millionaire copywriter, and an Advisor in The Oracles. 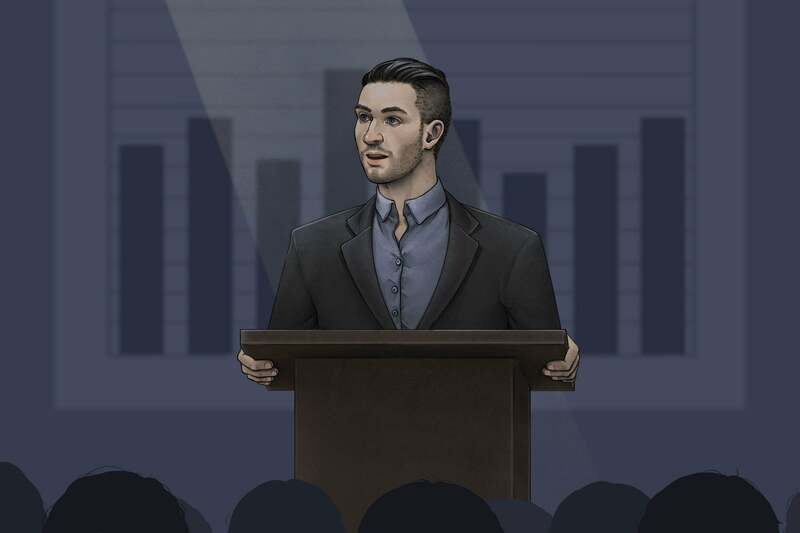 Public speaking is one of the highest-paid professions in the world, with in-demand speakers making tens of thousands of dollars for short talks given to events, conferences, and companies. Top pros even sell their products and services to captive audiences, generating multiples of their high speaking fees. Even if you’re not in the top tier of public speakers, speaking in front of audiences creates instant credibility that translates into income. If you give talks on Facebook advertising, chances are you’ll establish yourself as a Facebook advertising expert. This kind of expertise translates into paying clients and customers. Still, few people believe they can master this high-income skill. They’re too scared or think it’s too hard. I’m here to tell you otherwise. I built a large portion of my multimillion-dollar business on public speaking, and I started completely from scratch. I, too, was afraid of public speaking at the start. But thanks to the tips below, I was able to go from having zero experience to feeling confident speaking in public, to doing it professionally and charging five figures and more per talk. Practice is the way to overcome fear. Fear is the first and biggest barrier to making high income through public speaking. Many are afraid of public speaking, not because it’s truly scary, but because it’s unfamiliar. And it’s unfamiliar because most people haven’t practiced it enough. To start, you must practice public speaking — real speaking in front of real people — regularly. This is easier to do than you might think. I recommend people post a video on social media or a blog on any subject every day for 30 days. Real progress comes from repetition. Before you try to book public-speaking engagements, do the 30-day challenge to overcome your fear. Once you do, you’ll be equipped to start booking gigs. How do you book a speaking gig if you’ve never done a talk? You speak for free. The reality is that it’s far easier to get opportunities when you’re already doing public speaking. Reach out to local schools and community organizations or leverage your network to get in front of an audience, no matter how small. Speak for free on the subject of your expertise. Even if you’re not getting paid (yet), these first gigs will give you credibility and experience you can translate into bigger and better opportunities. Film every talk you give. No matter how small the audience, film every talk so you get the most value out of it. Post the talk online. Share it with your networks. This can dramatically accelerate your journey to high-income public speaking. It only takes one person seeing your video online to lead to the next opportunity, which you’ll then film as well. This compounds over time. For instance, I received an email from a college to come and speak. I did the talk for a small classroom of students and posted it online afterwards. Within months, I’d received several offers from other colleges, after their students saw the video of my initial talk. Focus on the audience, not yourself. Once you have some speaking expertise, it’s time to take your skills to the next level. Even today, some of the best public speakers sometimes use “um” or mess up a word. Going pro isn’t really about perfecting your delivery. It’s about being obsessed with the audience, not yourself. Most people who fail at public speaking fail because they are obsessed with themselves, not the audience. They ask themselves: What will the audience think about me? What will they say about me? Do I look stupid? Do I look silly? The pros, however, know that the audience is there for themselves. They are there to learn or achieve something. They don’t care about the speaker, except to the degree the speaker can deliver their desired outcome. Every time I walk on stage, I’m not concerned about getting the words perfect. I’m concerned with breathing life into the room and creating the most value possible for my audience. Obsess over the audience’s needs, and you’ll start going from apprentice to pro very quickly. Don’t be afraid to charge what you’re worth. Once you’re booking events regularly, you’ll probably get asked how much you charge. Don’t devalue yourself, especially if you have a platform or have written a book. Understand that you can always go down if the event planner thinks your rate is too high. Once you have built up your credibility, event planners assume you’re not free. And most realize that desirable speakers cost money. Even if you can’t net the rate you want, you can get creative with your pricing. I typically charge a hefty fee to speak. But if an organization can’t pay my fee, I sometimes reduce or waive it as long as I can pitch the audience my products and services. Then I split the profits with the event. The point is that fees are negotiable, and event planners understand that. So negotiate with them, not against yourself. At the end of the day, the people making the most from public speaking do so because they charge what they’re worth. And they’re worth so much because they built their skills and reputations talk by talk, one step at a time. Make no mistake: Nobody comes out of the womb good at public speaking. Even the highest-income speakers on the planet today started from scratch. The only difference between them and you is that, at some point, they took massive action to improve their public-speaking skills. Don’t Solve That Problem Tomorrow. Do It Right Now.